I WOULD personally like to thank Shaun, Dave and the Highways team for their work installing the memorial bench on the green just in front of Trevor’s the barber and Alegro music shop, along the Marston Road next to the memorial plaque. They will serve as a brilliant memory for the members of our community who gave their lives in the Second World War. MICK Haines (ViewPoints, December 17) is so right that road clogging will become much worse if the proposed housing development of 900 homes goes ahead at Marston. Equally, Witney’s already congested roads will suffer further if the proposed development of 1,100 homes takes place. These plans are badly thought out. What is really needed is low-cost housing in small-scale developments in surrounding villages, that need a boost so the local businesses can benefit. No doubt developers would not take on these smaller developments as they can’t make the huge profits greedily gained from larger developments. Many village pubs are closing through lack of business (one a week) I believe. The small village shops endure the same. Villages need a boost, not the towns. TRAFFIC in Marston cannot cope with the pressure of a major new development that could be approved tonight, a councillor is warning. Mick Haines, who is due to speak at an Oxford City Council’s meeting on the Barton Area Action plan, has carried out surveys on traffic in Oxford Road through Marston village and Marsh Lane he says proves the area is gridlocked as it is. He also believes the problems of flooding in the Marston area could also be exacerbated by the development on a flood plain. Mr Haines said: “With the extra 900 houses going up at the Barton estate, it is scandalous. It floods badly on the Ferry Road, Edgeway Road and Elsfield Road. A petition demanding a stronger infrastucture to tackle flooding and sewage in the area before the development is built has so far gathered more than 800 signatures. A number of residents in the area have also complained about the impact of traffic on their properties, with reports of cracks in their walls. Susan Jarrett, from Cherwell Drive, is one of those worried about the amount of traffic coming through Marston. Mrs Jarrett, 62, said: “I agree that the traffic is absolutely awful. You can’t get out of the house or the drive sometimes. A lot of that is to do with the hospital. Mr Haines said this was backed up by figures his study in Oxford Road on Tuesday, December 4. He said it was used by 657 vehicles between 7.45am and 9.45am. A similar study on Monday, December 10, saw 740 vehicles between 8.15am and 10am. In Marsh Lane, there were 844 vehicles passing through between 8.30am and 10am on Wednesday, December 5. And 1,120 vehicles went through the area between 8am and 10.05am on Wednesday, December 12. If the proposal to build the new homes in Barton goes ahead this is only likely to get worse, he said. Proposals for the development on a 36-hectare site north of the A40 at Barton will be discussed by city councillors tonight. The head of city development will present a report proposing the adoption of the Barton Area Action Plan. The blueprint for up to 900 homes at Barton West has already won the approval of planning inspector Dr Shelagh Bussey. If the plan is approved by the full council, an outline planning application will be submitted in the spring. IT provides a place to sit and reflect on the sacrifice of Marston’s war heroes. A new bench in Marston Road honours the 27 men from the parish who were killed during the Second World War. The road is already lined with trees which were planted on Armistice Day in 1950, and a plaque put up last year lists the fallen soldiers’ names. Money for the new bench and the plaque came from Marston city councillor Mick Haines’s community grant fund. The plaque cost £500 and was put up last October, and the bench cost £1,500. Mr Haines said villagers had wanted to find a lasting way of remembering Marston’s war dead. He said: “When we found out the reason why the trees were planted there, we decided we wanted a plaque. “The plaque was put up last year and we had a ceremony. “The vicar read out the names of those who died and we had The Last Post. 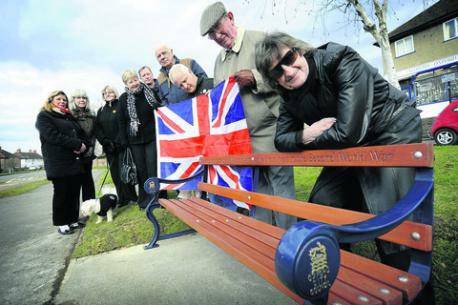 The bench has been welcomed by Marston residents, including grandparents Malcolm and Cynthia Kitching, of Lewell Avenue. Former Oxford University stores worker Mr Kitching said: “I’ve lived in Marston for 40 years and my wife was born and bred here, and we think it’s a very good idea. Armistice Day marks the signing of the Armistice pact between Allied troops and Germany at the end of the First World War. It also commemorates those who died in the Second World War and subsequent conflicts. A BLUEPRINT paving the way for up to 900 homes in Barton, Oxford, has been given the go-ahead by councillors. City councillors voted to adopt the Barton Area Action Plan at Monday’s full council meeting, which sets out the policies determining how the site to the west of Barton will be developed. A primary school, food store and park are also planned as part of the development on a 36-hectare site north of the A40. At the meeting Mick Haines, councillor for Marston, said he was concerned about an increase in traffic as well as flooding, and that Marston would not be able to cope with the major new development. Following the meeting, council leader Bob Price said: “This is the final step in a long process that dates back through several phases of consultation and inspection. The document is part of the Oxford Local Plan, which is the overall framework for planning in Oxford from 2001-16. Ed Skeates, project director at Grosvenor, the city council’s development partner which together form the Barton Oxford LLP, added: “The masterplan, following a successful series of engagement programmes, is progressing well and we’re on track to submit a planning application in spring 2013.